Inoplas has been designing and manufacturing simple and complex cable assemblies since our early days and we have the skills and capability to build test and, if required, overmould most types of cable. In fact around half of what we produce leaves us with a cable of some sort attached to it. 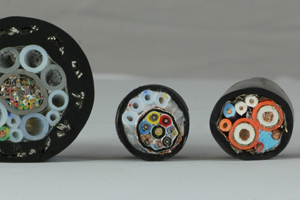 We carry a huge range of standard and bespoke cables for control, measurement, data, power and other applications as well as connectors, terminals,crimps, sockets and pins including many parts other believe to be obsolete. Inoplas is an approved supplier for a number of industry leaders manufacturing standard and bespoke products ranging from High-Voltage Power Supplies to equipment for the hearing impaired and of course we can overmould strain relief and other features as required. Working to your specifications Inoplas can source and produce all the components to assemble and test your build. We have invested in a new Kappa high speed automatic cutting and stripping station to complement our existing Schleuniger machinery. Our new state of the art Kappa wire cutting and stripping machine is designed for the reliable controlled processing of the finest wire sizes from 0.02 to 6mm² and an outside diameter of up to 10mm within ± 0.2%+1mm repeat accuracy. Innovative sensors aid set up and repeatability and make cut losses a thing of the past. Most of the cables we prepare go on to be crimped or soldered to components in one of our dedicated cells before being overmoulded to provide strain relief, high IP ratings and, of course, the high quality finish our customers expect.